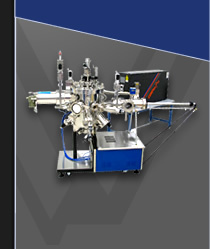 SVT Associates, Inc. (SVTA) is a world leading manufacturer of Molecular Beam Epitaxy systems (MBE), Atomic Layer Deposition equipment (ALD), and Thin Film Deposition tools for both R&D and production environments. Since 1993 SVT Associates has been providing customers with innovative solutions in thin film technology, spanning electronics, photonics, coatings and renewable energy and other applications. SVT Associates also manufactures deposition sources used in applying Thin Film Photo Voltaic layers, for both development as well as linear and large area sources used in pilot production and production. We produce Custom UHV systems, often with multiple chambers and unique requirements for sample handling and processing or analysis. Ultra High Vacuum deposition systems with demanding vacuum requirements to provide the purest deposited thin films and the cleanest interfaces is our specialty. We produce not only the systems, but also custom deposition sources, process monitoring tools, and other components to meet your requirements. SVT Associates' Laboratory offers thin film epitaxial and process development services, as well as contract research. Our lab scientists are experts in epitaxial growth of semiconductor and optoelectronic materials. We have expertise in the deposition of oxides – for example oxide MBE including Plasma Enhanced MBE and Laser MBE. Our Lab has cutting edge publications in nitride MBE including the development of unique high power HEMT structures and UV detectors. Our work with MBE of antimonides includes InAs/InGaSb Superlattices for Infrared Detection and Imaging. SVT Associates has demonstrated exciting new application areas for Atomic Layer Deposition (ALD), using the characteristics of ALD to create effective barrier layers using very thin deposits.